Get the facts about adult asthma, including who gets it, what triggers it, and how allergies can affect it. Dr. Chad J Aleman, MD is a Doctor primarily located in Marietta, GA, with another office in Kennesaw, GA. He has 18 years of experience. His specialties include Emergency Medicine and Pulmonary Disease. He speaks English. Dr. Aleman has received 3 awards. The overall average patient rating of Dr. Chad J Aleman is Great. Dr. Chad J Aleman has been rated by 12 patients. From those 12 patients 4 of those left a comment along with their rating. The overall rating for Dr. Chad J Aleman is 4.3 of 5.0 stars. Dr. Aleman is always professional, takes the time to ask questions about my health and shows he genuinely cares. I had vein treatment in 2012 and still very happy. Thank you! Have been a patient for about two years. Had tried to get rid of my veins for years. Went to quite a few vein treatment medical facilities. Never could. They are now all gone and they stay gone. Every single person from the doctor on down are unfailingly patient and courteous and knowledgeable. I have had many appointments and it has always been the case. I love this office . Everything that was done to my legs has made them better. I love the way my legs look now. I can wear shorts and feel good. Thanks for taking such great care for me. 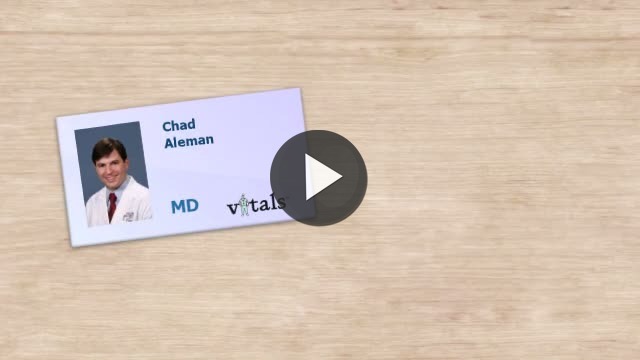 Take a minute to learn about Dr. Chad J Aleman, MD - Emergency Medicine in Marietta, GA, in this video. Dr. Chad J Aleman is similar to the following 4 Doctors near Marietta, GA.
Have you had a recent visit with Dr. Chad J Aleman? Select a star to let us know how it was.